We lost a very good friend and member of our Trigard Family in December. Bobby Goodwin of Hecox-Goodwin was always so full of life. He was fun to be around. He knew how to have fun, but yet when it came time to be serious, he knew how to do that just as well. He was always pushing us at Trigard. He was always thinking outside of the box. He was a very successful businessman because he wasn’t afraid to try new things. We will miss Bobby greatly. He always kept us on our toes, and he has left a great legacy for his family. 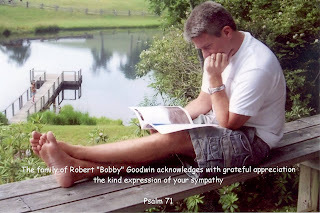 I feel blessed to have known Bobby Goodwin. I remember the first time I ever met Bobby…..I walked away from him thinking, wow this guy has a lot of energy! His energy was always positive. He embraced everything he did with a passion which was contagious. That is what I loved about him the most. He was such a great encourager. Every time we had a Trigard convention, he would always stand up and speak such positive powerful words to our dealer network. Bobby often times pushed us for things, which we truly appreciated, because it did make us better. I loved that he had a great understanding of family, and what that means to life in general. It made him a great vault man. We shared a common love of horseback riding. Each time he ran into Bill or me, he would ask us if we had been to the ranch and what we did. I was glad to see he got to take his trip to the ranch. So Bobby, our dear friend and colleague, you will be missed, but never forgotten. May your legacy live on through those around you. Please feel free to share your memories with Linda and Donna.